Folding knife made upon specific requests of the department of the Italian Army 185 ° RAO ( Target Acquisition Regiment ) and is now included the eponymous department . The knife supplied differs from the calendar for the total lack of writings or logos on the blade. Limited Edition RAO model characterized by a satin blade in Japanese rolled steel produced by Takefu Steel. to the central plate and the 420J2 (56 HRC) In the specific CoS it is used to 61,5HRC (Cobalt Special deemed superior mechanically by 25% compared to the already appreciated VG10) for the two side plates, in order to have a very high capacity cutting but at the same time a remarkable resilience and resistance to oxidation. folding knife made upon specific requests of the Italian Department of the Army 185th RAO (Regiment Acquisition Objectives) and currently supplied to the homonymous department. The knife supplied differs from that only civil to the total lack of written or logos on the blade. Knife suitable for hunting, good skinner, practical and manageable. Thanks to steel CPM-S30V achieves high cutting capacity and a substantial tightness of the wire. Notes: every knife is unique as it is handmade, might therefore be small differences / inaccuracies with respect to the photographed model, also with regard to colors of blade and handle. Notes: 2013 knife in "20th anniversary" commemorative edition, designed to celebrate the 20 years of Mean Street production. Exemplary, never used, never sharp, perfect in every detail, exactly as it just came out of the factory. These knives are mainly sold by Busse without the needlework, so we have made them crafted in Kydex thermoformed. Note: The knife is present in the images for demonstration purposes only; Is not included with the sheath. For each year from 1999 to 2011 Chris Reeve has made in very limited runs (Model 30 specimens) of the special editions of his Large and Small Sebenza Sebenza using rare trees, delicate and peculiar. Use: Ideal for cleaning, chopping and dicing vegetables; also great for cleaning fish, meats and cheeses. Notes: cheek parts for XM-18 3.5 "
Kit of 11 original pieces Rick Hinderer Knives made entirely of anodized Machined Titanium, designed for XM-18 models from 3.5"
Kit of 18 original pieces Rick Hinderer Knives made entirely from full-worked copper, designed for XM-18 models from 3 "
The Berkel artisans have created an exclusive series of switchblade knives. 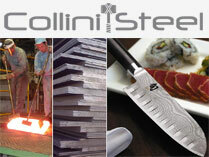 The research of the steel for the blade and high-quality materials for the handle, make these knives real collectibles. These unique pieces are numbered one by one from the Berkel cutting masters. - Handle: Made up of two cheeks wooden palm. Decorated with shiny red logo. - Notes: Gift box and scabbard. - Handle: Made up of two cheeks in olive wood. Decorated with shiny red logo. Folding knife developed together with the experts of the Department Jagdkommando materials, the special strength of the Austrian army. It has a tip designed to allow maximum penetration. It is equipped with a rear evacuation hammer, clip applicable in three positions and lateral secure. The handle is made with a particular finish for a better grip during use. The sheath desert kydex with hooking for M.O.L.L.E. system, allows storing the knife blade to open. One for the good guys, the Protagonist was designed with military and law enforcement front of mind. The knife is available in both drop-point and tanto, features 2-color rubberized handles and is easily integrated with a vest, belt or pack. Made in USA. Knife suitable for hunting, good skinner, practical and robust. Thanks to steel CPM-S30V achieves high cutting capacity and a substantial tightness of the wire. tactical pen with body and cap made entirely of stainless steel machined from full numerical control. * Ink: black with refill Fisher Space. Writes at temperatures from -35 ° to over 120 °, underwater, on dirty and oily surfaces, lasts 15 times longer than a normal non-pressurized refill, can draw a continuous line of 14 km thanks to the particular thixotropic ink, from semisolid consistency, which is made fluid by the special tungsten sphere. With Snailor Compact on your key ring you will always have with you a fun and useful tool opener and a drinking buddy. This cute little snail has become so much popular and requested that Jesper Voxnaes no longer able to realize handcrafted in adequate quantities to meet customer needs! These craftsmanships are distinguished by their classical lineage and their functional quality, which blends well with traditional production techniques and materials used. The blades are hardened to a hardness of about 40 HRC, after which they have been hammered by hand, the back and sides are clad with clay and the thread is retreaded to 60 HRC for excellent cutting, penetration and flexibility . The blade is then polished and sharpened by hand on stone and the knife is finished in every single detail. Blade: high-carbon DNH7 steel with selective clay 40 / 60HRC clay and high degree of mirror polishing. Notes: Sold with silk sheath and cordura carrying case. This diving knife was originally developed for a military program. Professional torch specifically designed for the identification and examination of large rough precious stones, amber or jade in gemology and jewelery. Equipped with infinite light variations from 1 to 800 lumens and concentrated light beam. Powers and durations certified in laboratory by ANSI / NEMA FL1 standard using 1x 3500mAh 18650 3.7V Li-ion - in different conditions of use or using different batteries, data may vary. Waterproofing: as per standard IPX-8 - submersible up to 2m. of depth for 30min.